Welcome home. 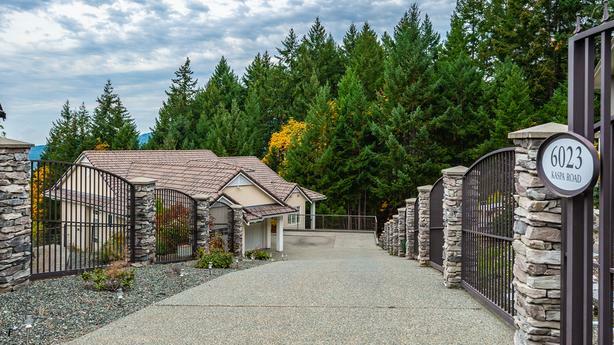 As you approach the impressive gated entry down the rock pillar-lined drive to the magnificent estate property, you can't miss the quality and the thought that was put into this home. Resting on one of the larger lots in the Properties with over .39 of an acre overlooking picture perfect sunsets and the stunning valley, your mountain and lake vistas offer total privacy. Walls of windows capture all the natural light and take advantage of the incredible views from most rooms. This was built as a custom home to the highest standards, with no thought or expense spared. With 4 bedrooms, 4 bathrooms, and a home office, there's room for a large family and guests. Modern open floor plan with loads of maple cabinetry and granite in the kitchen, grand ceilings in the living area and sitting areas, a luxurious split staircase, rich quality tiger wood hardwood flooring, endless built in quality cabinetry in almost every room and one of the most impressive bars you'll ever see. Spa-like ensuite with walk in glass walled shower and relaxing air soaker tub. Tile roof, intercom, built in speakers, 2 heat pumps, electric Hunter-Douglas blinds, heated towel bars, crown moldings, sauna, loads of storage and so much more. There is far too much quality to list here; you really have to see this for yourself. Hiking and mountain biking trails are literally at your door step, and Mt. Tzouhalem is your back yard. Minutes to Maple Bay Marina, Maple Bay beach, and local pubs and restaurants. This is incredible value. Book your showing today.